74,452 online conversations pertaining to 96 large technology brands, contained within 423 influential channels were monitored between July and September 2009 – Averaging at one brand mention every two minutes. Google and Microsoft topped the rankings by way of volume of conversations, securing approximately 20% and 12% of all monitored conversations, respectively. 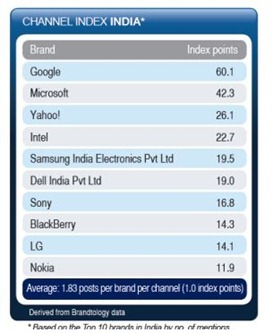 Yahoo!, Intel and Sony complete the Top 5 list, securing 14% of the overall conversation amongst them. 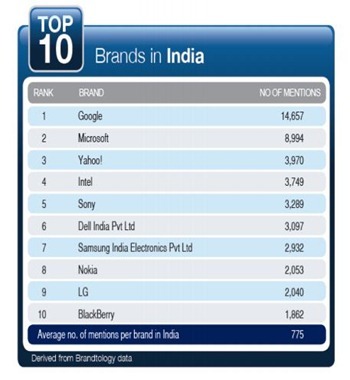 While Internet & Software brands lead the conversations online, Mobile & Telecom brands like Nokia and BlackBerry, as well as Consumer Electronic Brands like Dell, Samsung and LG also feature in the Top 10 Brands in India by conversations. Twitter is the King here –Twitter emerged as the “buzziest” channel in India with almost 60% of the overall conversation shares. 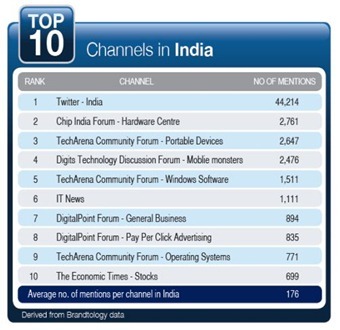 Twitter had close to 44,214 conversations while the next best “Chip India Forum” had only 2761 mentions. This clearly goes to show the amount of buzz and popularity Twitter has gained in a short span of 12-18 months – Awesome ! Select online forums, including the Chip India Forum, TechArena Community Forum, Digit’s Technology Discussion Forum and DigitalPoint Forum, emerged as other key hubs where technology related conversations take place, securing approximately 16% of the conversations amongst them. The survey has also come out with Two Indexes, which will provide excellent insights for Online Marketers – Conversation Index & Channel Index. Conversation Index is the Ratio of individual instances of online branded conversations, versus the average instances of conversation for all brands locally – Essentially it indicates how much conversation happen about a particular brand as compared to all of them. 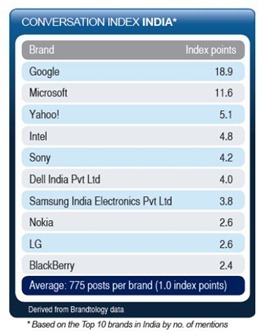 Google comes at Numero Uno position here followed by Microsoft, Yahoo, Intel and Sony. Channel Index is the ratio of total number of online channels (including social networking sites, forums, blogs and news sites) where comments about a brand are found, versus the average number of channels with comments for all brands locally. This is indicative of efficiency of channel engagement and targeting. Here too Google leads followed by Microsoft, Yahoo, Intel and Samsung.